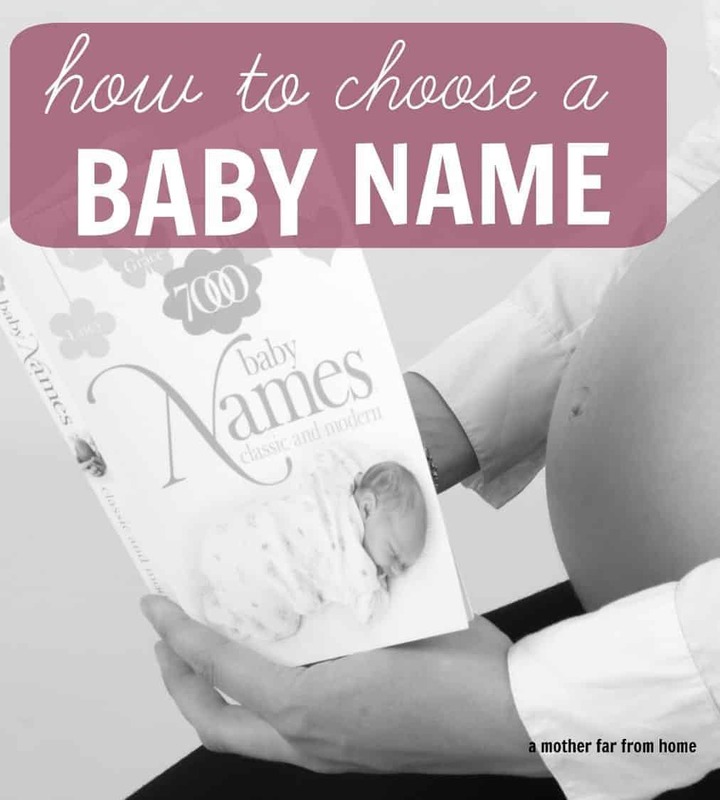 If you are pregnant and wondering what on earth you’ll call your bundle of joy, here are some thoughts on how to choose a baby name that’ll work for your family. How does one go about choosing a baby name? This may seem pretty self-explanatory, but I think choosing baby names is so fun and ultimately very important. I read once that you can seriously put your children at a disadvantage with the name you give them. There are certain names (and not ones that are simply ethnically diverse) that will make your child seem like a joke when they are at a job interview in a nice suit speaking to a potential employer. You may not like it and it may not be fair, but using our children’s name as a way of expressing our own creativity and preference for nonconformity is not always a great idea. A great way to start thinking about names is to get family members to make lists of all the names they can think of that run in the family in both genders. You may find a name or two you’d forgotten about but that are timeless. I think this is a great tradition and being able to keep a name running in the family is special, at least in my book. My grandfather (who I was very close to) was named Buford. Now, that was way big back in the 1920’s but just not something I wanted to inflict on my son. Nor did I think papa would mind. So, I shortened Buford to Ford and, voila, my son’s middle name was born. You don’t have to confine yourself to family names or carry down a name to the fifth generation (is that not reserved for royalty?) but sentimentality has its place. I must admit, I cared less about the meaning of names than my husband did. Sure, I wouldn’t name my child something that had its origin in the word evil or ugly, but neutral things like flowers (Lily or Rose) were fine by me. My husband, however, didn’t want the name to simply be neutral, but he wanted it to be a proclamation over our child. Something lovely that they could live up to. Start to think of adjectives that mean something to you and then search names that go along with those. You may be stuck between a few names and the meaning could push one over the top for you. 3) Is it super trendy so that when they’re 60 they will have the name that every teenager on the planet makes fun of? Names come and they go. Lucy and Anna are two. However, Lucy and Anna are both classic enough that, when they leave the #3 spot on the top 100 baby names list, they still won’t be “so 2012.” They’ll simply be what they are, classic. Biblical names are like this , sometimes their popularity ebbs and flows but they are classic and traditional enough (in most languages) to stand the test of time. Peter, Pedro, Pietro, Pater, all forms of the same name popular worldwide. Names that are weird unique and high up on the list are not likely to return. If you’re okay with that then have at it. If not, stick to some more traditional or class names. My grandmother said she was Hazel T. and there were at least 5 Hazels in her class throughout elementary school. Or at least ones that will not be shared by 12 other kids in their 2nd grade class. Oh, and try to avoid naming after celebrities (odd celebrity names, of course). I read in Freakonomics that celebrity names travel from the heights of society to the depths of society so those you may want to avoid. 4) Can it easily be turned into something that will bringing surefire taunting? Does it rhyme with stupid, ugly, fat or witch? If so, I’d rethink your decision. Of course, there will be a myriad of ways for mean middle schoolers to make fun of your sweet innocent children. That’s why we don’t need to add fuel to the fire. Think of how the names sound together and if you ask the question, “Will my child hate this name when they grow up?” and the answer is yes, then you are probably naming them selfishly. We are mothers and we have the privilege (along with other family members, of course) of naming our children. My husband and I loved the process both times (and hope to repeat it many more) and think it’s an opportunity to proclaim something great for your child. Of course you can name your children whatever you like, it’s your prerogative, but do consider your child’s future feelings in the matter. My mother’s maiden name was Rachels, hence my name, Rachel. I used to think I should change my name to Rachel Rachels. That’s weird, huh? I still think it would have been cool.